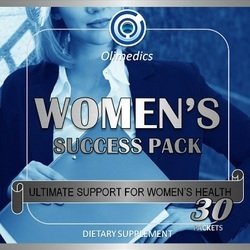 Take 1 packet daily preferably with a meal or as directed by a healthcare professional. CONTAINS SOY (LECITHIN), MILK (TRYPSIN), AND FISH. This product is manufactured and packaged in a facility which may also process milk, soy, wheat, egg, peanuts, tree nuts, fish and crustacean shellfish. KEEP OUT OF THE REACH OF CHILDREN. DO NOT USE IF SAFETY SEAL IS DAMAGED OR MISSING. STORE IN A COOL, DRY PLACE. Active ingredients: Vitamin A, Vitamin C, Vitamin D-3 (cholecalciferol), Vitamin E (d-Alpha tocopheryl acetate), Vitamin B-1 (thiamine mononitrate), Vitamin B-2 (riboflavin), Niacin (niacin granular), Vitamin B-6 (pyridoxine hcl), Folic Acid, Vitamin B-12 (cyanocobalamin), Biotin, Pantothenic Acid (d-calcium pantothenate), Calcium, Phosphorus (dicalcium phosphate), Magnesium (oxide / amino acid chelate), Zinc (glycinate monohydrate), Selenium (amino acid chelate), Copper (oxide), Manganese (sulfate), Chromium (as polynicotinate), Potassium (as citrate), Blueberry, Cranberry, Grape Seed, Strawberry, Raspberry, Pomegranate, Bilberry, Alfalfa, Carrot, Beet, Broccoli, Acai, Chokeberry, Apple, Apple Pectin, Maqui Berry, Grape Skin, Black Cherry, Tomato, Barley, Celery, Chlorella, Black Currant, Artichoke, Mango, Pineapple, Spirulina, Chlorophyllin, Dandelion, Wheat Grass, Green Tea, Milk Thistle, Eleutherococcus Senticosus, Ashitaba, Bing Cherry, Elderberry, Goji Berry, Grapefruit, Mangosteen, Spinach, Tart Cherry, Papaya, Cellulase, Bromelain, Papain, Amylase, Trypsin & Lipase, Spirulina Algae, Wheat Grass, Safflower (powder), Lecithin, Choline Bitartrate, Inositol, Citrus Bioflavanoids, Gotu Kola Powder, Echinacea Purpurea Root Powder, Green Tea (98% extract), PABA (para-Aminobenzoic Acid), Psyllium Husks,Oat (avena sativa10:1 extract), Apple Pectin, Chlorophyll (sodium copper chlorophyllin), L. Acidophilus, Octacosanol, Trace Mineral Complex, Kelp, Boron (as amino acid chelate), CLA Complex (70% conjugated linoleic acid from safflower oil), GLA Complex (25% gamma linolenic acid from borage seed oil), ALA Complex (50% alpha linolenic acid from flaxseed oil), EPA (Eicosapentaenoic Acid / fish oil), DHA (Docosahexaenoic Acid / fish oil), Soy Isoflavones, Black Cohosh, Dong Quai (1% extract), Licorice, Vitex Berry (herb powder), Red Clover Extract (1% extract), Sage (3% extract), False Unicorn (herb powder), Squaw Vine (herb powder), Blessed Thistle (herb powder), Red Raspberry (20% extract), and Mexican Wild Yam. Other Ingredients: Gelatin, microcrystalline cellulose, glycerin, purified water, vegetable stearic acid, vegetable magnesium stearate, croscarmellose sodium, silicon dioxide and pharmaceutical glaze.